I have been trying to clean out stuff on my photo files and WordPress drafts for this blog and found this photo of the Pesto Roast Pork that we cooked last fall. There were some frozen items in the freezer that I needed to use up or throw out. They weren’t spoiled or anything, they were just reaching the end of their freezer life. Plus, I needed to put more stuff in there and I didn’t want them to get lost in the bottom of freezer hell. 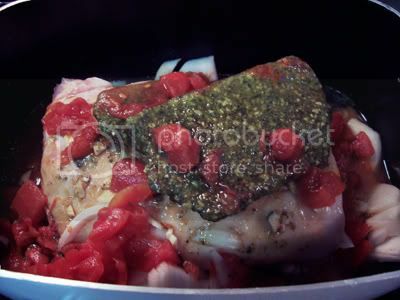 Long story short, I decided to put the frozen tomatoes and frozen pesto in this slow cooked roast. Who knew the combination would turn out so well! Too bad I couldn’t find a cooked photo, but trust me this was a great tasting roast and can be used to make sandwiches, tacos, wraps and whatever else you can think of. It was also really easy to make and I used up ingredients that I had on hand. Place all the ingredients above in a slow cooker. Set the temperature on medium or high and let it come to a boil/simmer. Lower the heat to low and let it cook for 6-8 hours or until the pork is fork tender. This looks great. I too feel the need to purge the freezer sometimes, but mostly because it’s so small!